Bill and Patti poured at The Clermont Expo 'Taste' held at Receptions Eastgate on March 30, 2011. YouTube - Clermont County Business Expo 2011 More than 100 vendors and business representatives attended this all day event, capped off by the 3 hour 'Taste' featuring Clermont County's finest restaurants and Harmony Hill wines. 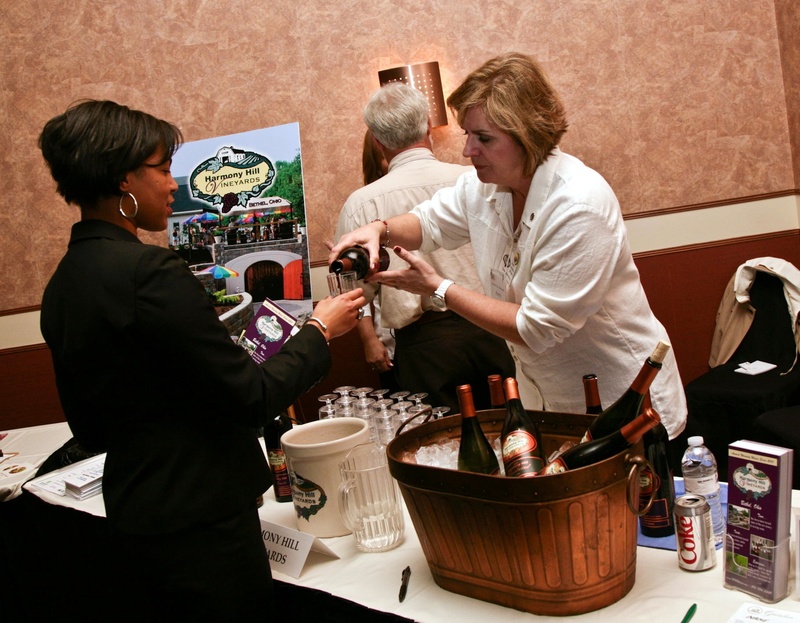 Thanks to Bethel's Community Savings Bank for sponsoring the wine table and assisting with the pouring of our wines. 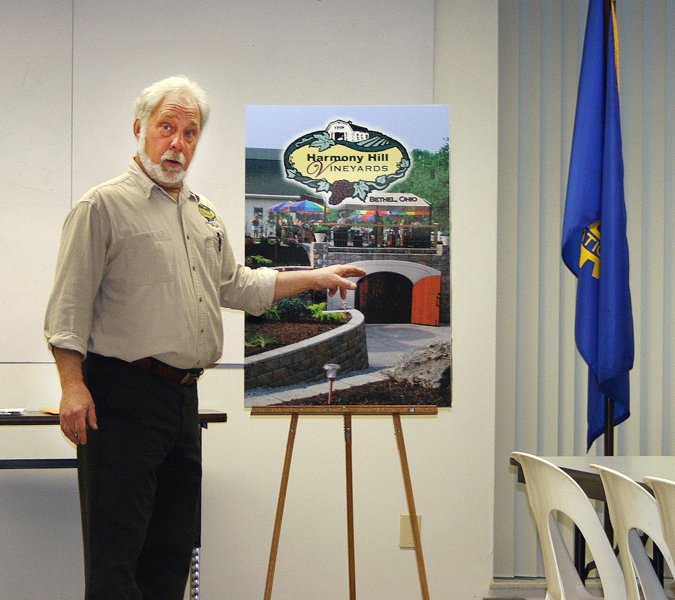 Bill made a presentation about Cincinnati's wine history and the growth of Harmony Hill Vineyards to the members of The Batavia Rotary on April 5 at The Clermont County Airport. 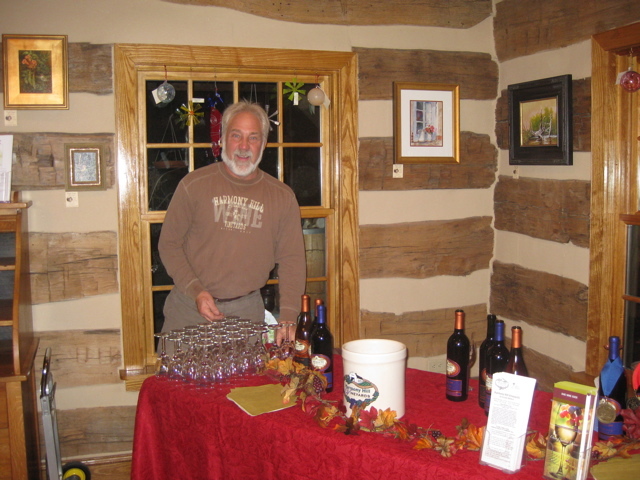 Bill pours at the Artisan Center, Moscow, Ohio, November 2009. Maple Creek Artisan Center, housed in a restored historic log building, was established to provide a traditional arts education community with a focus on nature, fostering new artists and furthering the heritage of Appalachia. Their 5,000 square foot gallery gives artisans a chance to sell and teach their craft. (USLBA). The USLBA "Best of Local Business" Award Program recognizes outstanding local businesses throughout the country. Each year, the USLBA identifies companies that they believe have achieved exceptional marketing success in their local community and business category. These are local companies that enhance the positive image of small business through service to their customers and community. 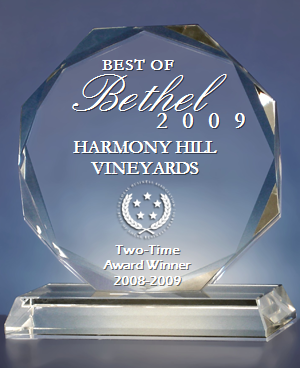 Harmony Hill Vineyards Receives 2008 Best of Bethel Award Washington D.C. -- Harmony Hill Vineyards has been selected for the 2008 Best of Bethel Award in the Wineries category by the U.S. Local Business Association (USBLA). 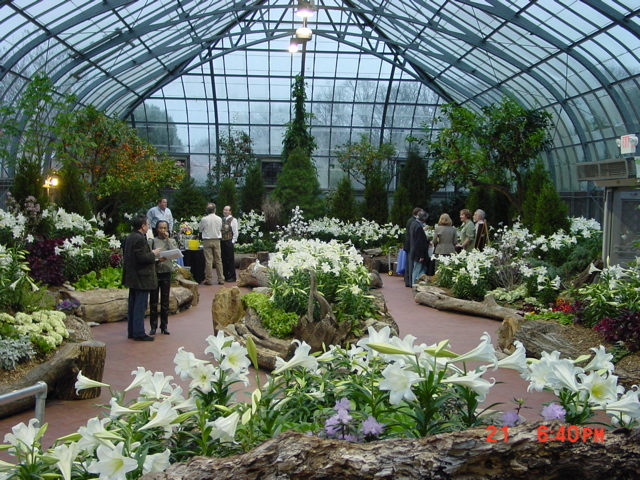 Harmony Hill at Krohn Conservatory, an all-Ohio winery event, celebrating the life of Nicholas Longworth. 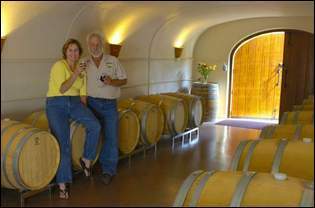 Harmony Hill Vineyards is again 3 for 3 in 2008! Of the three entries submitted to the Finger Lakes International Wine Competition, all three won medals. BridgeTech/Conspan, the manufacturers of our barrel cave, has included the project profile from the cave in their new international sales catalog, so it will be seen all over the world. Click here to see this page in their catalog.